There are infinite ways to share the experience of virtual reality with guests or attendees through events, but one of the most universal ways of experiencing virtual reality is through gaming. Video games have long since been given the reputation for being isolating however with the focus on multiplayer style gaming, over the years there have been numerous success stories of gaming bringing together the masses, this can especially be seen with the current rise in battle royale style games like Fortnite and Apex Legends. Virtual reality games over the years have caught up to the demands of traditional video games and the demand for full immersive multiplayer experiences has led to a variety of VR multiplayer experiences suitable for all ages, tastes, and gaming abilities that can be incorporated into any team building activity or event. With so many multiplayer virtual reality experiences that have been released and are set to launch here is a break down of the top 19 best multiplayer virtual reality games for events. Cloudlands VR Mini Golf takes the beloved pastime of putt-putt mini golf and gives it a modern edge that is perfect for those who love a great game of golf or those looking for an exciting twist on the sport. 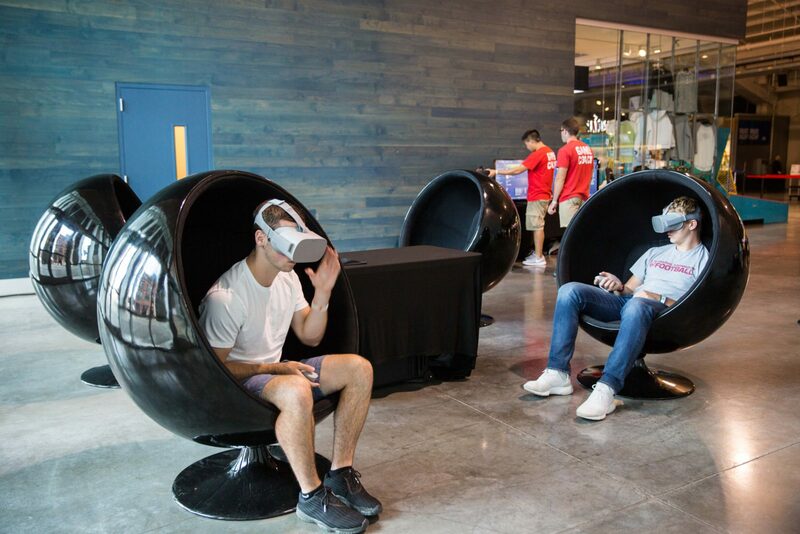 No need to drive the group to a golf course, rent equipment or rent out a venue, just set up a virtual reality station at an event and attendees will immediately be transported into the whimsical world of Cloudlands Mini Golf. One of the biggest multiplayer virtual reality launches of the past few years has been Minecraft VR as it offers the ability for not just two players but four players to experience the game at once. Something that many virtual reality games have yet to achieve. Minecraft has been a game dear to the hearts of many since it’s initial debut into the gaming universe in 2009. Now there is a way to experience the whimsical blocky world of Minecraft that has never been done before. In first person fully immersive virtual reality. Minecraft VR is available on the Oculus Rift platform and is another great game for family-friendly or kid-friendly events. DiRT Rally VR brings all the classic behind the wheel racing video game nostalgia but offers a fully immersive experience that can only be achieved in virtual reality. The game offers single-player racers the chance to explore the virtual world behind the wheel as well as the ability to race head to head in multiplayer mode. A racing game is a classic addition to any arcade and now there is a virtual reality version suitable for all ages and events where attendees have a need for speed. This next virtual reality multiplayer experience is not as kid-friendly or family friendly as other mentions on this list but it definitely provides the thrill and adrenaline rush that some attendees are looking for. With the rise of escape room experiences, there is now the ability to create your very own escape room inspired experience at your next event with Playstation’s Keep Talking and Nobody Explodes. Players will team up and face challenges such as defusing a bomb and more activities that will keep the group on their toes and on the edge of their seats. Playstation released The Playroom VR which essentially is a collection of animated mini-games, missions, and interactive experiences built for the multiplayer experience. Think of an entire arcade full of games shrank down into one compact experience within a VR headset and you have Playstation’s Playroom VR, best of all this game is free with the PSVR. This is a great addition to any family-friendly or kid-friendly event as it offers a broad selection of colorful and whimsical games and adventures that will captivate and entertain any audience. Rec Room VR is an interesting take on the online multiplayer experience and virtual reality gaming, as it presents a hybrid MMO (Massively Multiplayer Online Game) and RPG (Role Playing Game) inspired experience. This is a great game to showcase at an event where players can see first hand the social side of virtual reality gaming. With many creative hands-on activities and features to personalize, Rec Room VR is another great pic for family-friendly and kid-friendly events. Tabletop Simulator VR, originally released in 2015 got a virtual reality update in 2016 that now allows players to enjoy all the beloved classic card and board games in fully immersive virtual reality. This game is a great addition to any event because unlike most virtual reality games on this list, Tabletop Simulator offers a wide variety of familiar card games and board games ranging from chess to checkers so attendees will have no problems adapting to the game itself. Players can compete against each other like they would in the traditional format of this game bringing old skills to a new experience for all event attendees. Echo Combat offers a virtual reality shooter experience from the future. This Multiplayer game is great for those who love the mix of sci-fi and first-person shooter games and is a great addition to any gaming lounge at an event or as a stand-alone virtual reality addition to any space or sci-fi themed event. Sports Bar VR is the ideal multiplayer experience for anyone who adores the atmosphere of their favorite sports bar or beer hall. The game includes a multiplayer compatible version of all the sports bar stables including shooting pool with friends. This virtual reality game is the perfect addition to any beer garden at an event or gaming lounge that needs a high tech twist on the classics. For those who have ever wondered what it would be like to play with magic, Wands VR offers an incredibly captivating multiplayer experience where players can take part in missions, cast spells, and event battle one another in the fully immersive world of Wands VR. This is another great addition to any whimsical kid-friendly or family-friendly event or any event that needs a touch of magic and sorcery. One of the first big releases in virtual reality gaming was Fruit Ninja VR and Fruit Ninja still remains one of the best games for group experiences and events because there is no other virtual reality quite like it. Players can slice and dice the falling fruit and rack up points all while avoiding the falling bombs. This family-friendly game is perfect for video game lovers, beginners, and everyone in between. The Google Tilt Brush is the only exception on this list where the technology itself was not created as a multiplayer experience but The Google Tilt Brush is one of the only pieces of virtual reality entertainment that can be used in such a diverse range of ways that there are multiplayer applications of the Tilt Brush like playing Pictionary with the Google Tilt Brush itself. Guests can put their basketball skills to the test and step onto the court in totally immersive first-person virtual reality. Players can explore the game in many ways, testing their shooting skills in the Three-Point Shootout mode where players can attempt to make as many three-point shots in the allotted time and rack up the highest score. Players can test their accuracy in the Skills Challenge mode where players need to dribble the ball through a series of obstacles and targets before trying to sink the ball into the hoop. In Buzzer Beater mode players must race against the clock and attempt to make as many baskets as possible using the balls around the court. Throughout the game players can improve their character’s accuracy, quickness, and stamina through finding and earning ‘Gatorade Boosts’. This game is the perfect addition to any sports themed event or any event that needs a sporty touch. Enjoy the thrill of alpine skiing in realistic first-person virtual reality created to capture the sights and adrenaline rush of downhill skiing without the motion sickness. Users can partake in downhill alpine skiing through three different gaming experiences. Users in the Slalom Mode can race themselves or friends. Users in Freestyle Mode can ride through the snowparks and experience big thrills with extreme air jumps and cliffs. Experience Multiplayer mode in the parks and the player who lands the bigger tricks receives a higher score. Users in Heliski Mode can explore 100km2 of backcountry skiing. This is the perfect addition to any winter event or winter sporting event where guests can take part in the sport themselves all from the comfort of the event venue or gaming area. Much like Beatsaber, Audio shield is like a cousin to the recent popular 2018 release. Guests can now experience their entire music collection in virtual reality. Block the incoming beats and notes with your shields and experience music in a whole new way. Audio shield works with any song file as well as online music streaming for endless options for musical experiences.